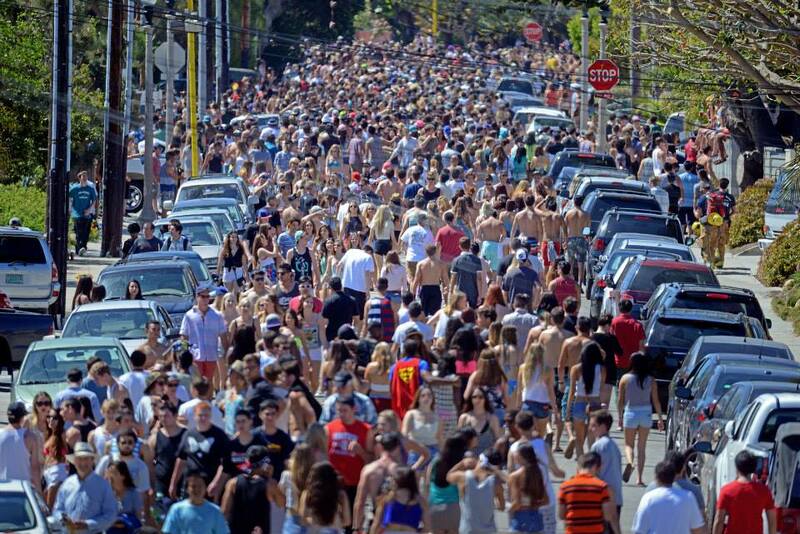 The notorious weekend of college student day-drinking and partying called Deltopia returns April 6, and community groups, Isla Vistaâ€™s government, UC Santa Barbara, and the City of Goleta are quickly preparing to circumvent the postâ€“spring break party. But the newly formed Isla Vista government said some of the measures should be cut. Ahead of the parking restrictions and potential damage to cars during the weekend, the university is encouraging students to move their vehicles onto campus. The school is selling permits to its students for parking on-campus, too, but overnight visitor parking will be suspended, part of community efforts to turn away out-of-towners after riots occurred during Deltopia in 2014. An estimated 25,000 people attended that year, and several police officers suffered deep lacerations while trying to control the immense crowd. Six police roadblocks will be set up Friday night through Monday morning. Parking restrictions in Isla Vista will extend out to parts of nearby Goleta as well. Residents are required to use parking permits sent to their homes to park on the street for the weekend, while cars without permits will be towed or cited. Goleta residents needing additional permits can go to City Hall on Friday with proof of address to get more, according to City of Goletaâ€™s website. The festival ordinance, in effect Friday through Monday, prohibits loud music from 6 p.m. to 7 a.m., a change from the usual loud music restriction in I.V., which begins at midnight on weekends. Residents who violate the ordinance can expect a $500 fine, according to UCSBâ€™s Deltopia information flyer. To divert the I.V. crowd, UCSB will host a concert at the Thunderdome on Saturday night with Troyboi, an electronic music artist. Other events throughout the weekend include roller skating in UCSBâ€™s Recreation Center on Friday night and a lecture from investigative journalist Beth Macy on opioid addiction in America. The Isla Vista Community Services District, I.V.â€™s local government, plans to spend $2,000 this year on safety stations for Deltopia, tents set up on street blocks with community service officers. The stations will provide small snacks and water as well as community services officers to walk party-goers back to their residences if requested. And while police presence during Deltopia is expected to be much higher than on normal weekends in Isla Vista, Spencer Brandt, Community Services District board president, said the increase in staffing was unnecessary. â€œMy message to the sheriff would really be that if you’re looking to save money, this is the perfect place to start, because we don’t need 60 officers from the Sheriffâ€™s Department in Isla Vista to staff Deltopia,â€ Brandt said. Although community group efforts have increased the safety of Deltopia in recent years, police presence in Isla Vista remains high, Brandt said. Numbers from the Santa Barbara County Sheriffâ€™s Office show arrests and citations decreased by 70 percent from 2014 to 2018. Brandt said the â€œdisorganizedâ€ nature of Deltopia warranted a more organized response. One of his ideas is to create an organized music and arts festival during Deltopia weekend, which would provide its own security. He recently met with organizers of Lucidity, the three-day music festival happening the weekend after Deltopia at Live Oak Camp, to discuss a collaboration on an event in Isla Vista. â€œIf we can get buy-in from folks at the university, other nonprofits in I.V., and ourselves as well â€¦ [then] we can start to take a more proactive approach,â€ Brandt said.